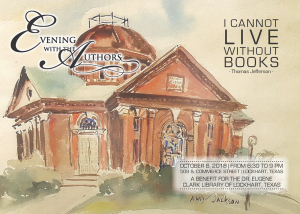 Authors from the Central Texas area will be on hand to sign their books and visit with avid readers Saturday night at Evening with the Authors, a benefit for the Dr. Eugene Clark Library. It will run from 6:30-9 p.m. in the garden at 509 S. Commerce St.
For reservations, contact evening with the authors@yahoo.com or call 512-559-1135. Visit www.eveningwiththeauthors.com for advance tickets. Read more about the event in this week’s Post-Register.